When is a Time Capsule Vault Necessary? No, not for our time capsules, it isn’t. But sometimes there are reasons for encasing any time capsule in a vault. If environmental conditions are harsh during the time the capsule lies in place, you may need to give it extra protection. Poor conditions can be as simple as the area getting more water from above or below sea level than normal. For instance, Florida’s Key West area is a terrible place to bury a time capsule because it’s below sea level. In their case, they used some extra protection from the water coming up from below the time capsule placement. Are you in earthquake country? Will the area be earthquake prone in the future? This is a harsh condition. In such a scenario, the vault will provide some protection from earth movement around the time capsule. In general, if you expect an earthquake of 7.5 or more during the time of interment, consider a vault to enclose the time capsule. How Long Before the Time Capsule is Opened? If the time expected before opening is longer than 100 years, you should consider a vault. You will likely not be the one to open the time capsule in the future. You do not know the future conditions over time. What if earth-moving equipment comes along and pierces the container? In this case, a vault provides physical and mechanical protection. Such equipment will hit the vault before it hits the time capsule. That’s a good thing. Is there a reason for you not to trust the time capsule container’s protection? Do you suspect its quality? Consider the material used to make the container, the material used to make the seal, and the design. Certain materials used for time capsules are ‘iffy.’ They may be okay, but you should consider their shortcomings. If the time capsule is plastic, this material is subject to cracking. In this case, you should consider a short period of interment and a vault to enclose it. If the time capsule material is mild steel (or stainless 302 or below), the material is subject to corrosion. One way to extend the life is to paint it. Another way is to use a vault’s enclosure. For instance, some people like to use a surplus ‘ammo’ can for their time capsule. 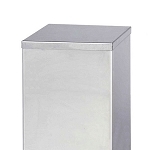 The material of a surplus ‘ammo’ can is mild steel, and it will corrode over time. It’s usually painted with an olive drab paint. This serves to slow corrosion for a time, but it will not prevent it. The ammo can has a plain rubber gasket seal. Add the likelihood of can corrosion to the poor rubber seal, and you have a poor choice of time capsule container, whether you use a vault or not. Other time capsules available as of this writing include stainless steel, aluminum and composites. 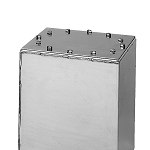 If you choose an aluminum time capsule, be sure that it’s thick enough to withstand oxidation and corrosion. If you choose a time capsule made of a ‘composite’ material, ask what each of the materials in the composite is. Then check the aging characteristics of each and the capsule design. As of this writing I could not find enough details from the manufacturer’s websites to make a good report. 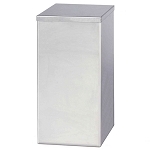 For our time capsules, we use 304 or 304L stainless steel (see below). This example of a container that leaked is sobering. Opened in 2013 and only 20 years underground, this UNMC time capsule leaked. Can anyone tell me what the material was? Perhaps a tin or mild steel - it quickly corroded. It’s important to consider how your time capsule seals. Not only is the design of the time capsule closure important, the material used to seal it up is important, too. The material used for the time capsule container is the most important thing to consider. How it seals is the next most important consideration. The way a time capsule seals is a prime way for moisture to get inside and ruin your contents. What material makes up the seal? It’s usually called an “O-ring” or “gasket.” If it’s made of rubber or elastomer, you should ask, “What are its aging characteristics? That’s most important for time capsules. Take a look at the shelf life of the material. Pay no attention to how it performs for chemical or temperature or pressure resistance. Aging is the most important characteristic for time capsules. For our time capsules, we chose Silicone Rubber (an elastomer). It has excellent resistance to ozone, weathering and aging. It has an unlimited shelf life. The design of a time capsule seal is important. Does it allow for moisture to get through or around the seal and into the capsule? Besides the material of the seal, does the design of the time capsule closure make sense? 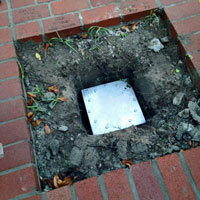 If the time capsule closes via a gasket or O-ring, does the design make it ‘blind’? Our bolted time capsule features a blind design. First, an o-ring groove allows the silicone o-ring to fit exactly inside. We doubt that moisture will get past the o-ring, but if it does, we cap off the bottom of each bolt hole to make double sure. If the formed gasket just sits there, flat, consider what would happen if the gasket material cracked over time. Would it allow any moisture to get through? If you construct a vault, or use a pre-fabricated one, pay attention to how it drains. 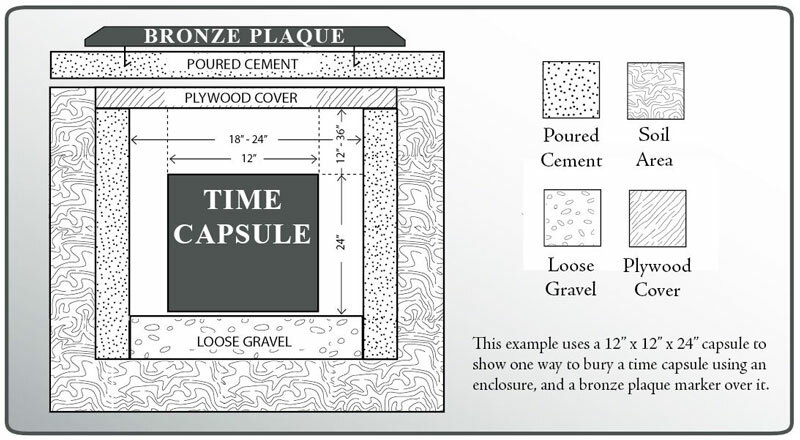 As for placement, the time capsule should not receive more water than usual, such as would placement in a garden setting. In the same vein, never wrap our time capsules in plastic. The plastic will hold moisture to the metal, and instead of protecting it, it would hasten corrosion over time. Look into concrete that is treated with waterproofing agents. But allow the vault to drain for above sea level placements. This image shows an example of a typical burial with vault, and the area above it sealed off and a plaque placed above it. In general, the time capsule is placed far enough below the surface area so that it takes advantage of the stable temperature underground. Any enclosure around it should allow for drainage of water that would normally come in from above ground (this is an example for above sea level). We use stainless steel 304. 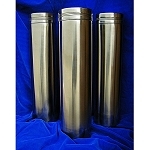 You want the properties of the metal that you choose for a time capsule container to be the least corrosive possible. 304 or 304L (low carbon) are good choices. 316 stainless steel is also good, but it is more difficult to fabricate. Do not use mild steel. Do not use thin aluminum. Do not use plastic. Do not use burial caskets. Do not use containers whose exact materials are unknown (i.e., composites). To use such items is a gamble, and you should not bury the container.